I’ve often heard of things being “nested like Chinese boxes” – but what I get, are these nested packages from India. 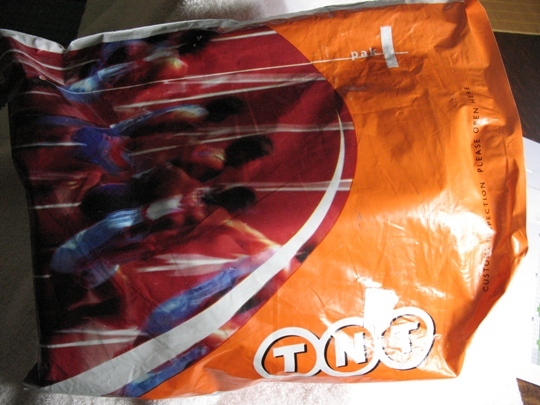 I don’t think I’ve ever had anything so thoroughly packaged, as the things I get from India. This time, it’s needles. 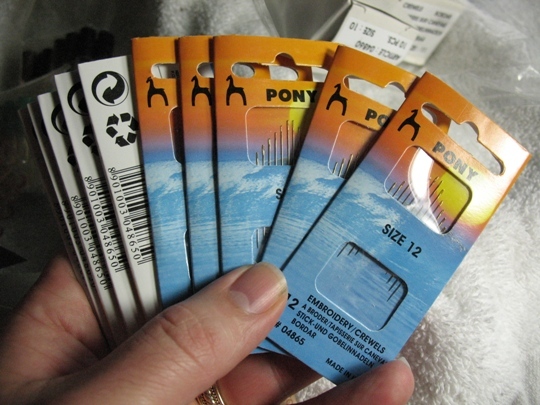 I wrote to the folks at Pony Needles in India, and asked if I could place a small order. I couldn’t find anyone here in the US who carries their amazingly fine crewel needles (see this post) – except for Lacis, who carry the #12 in the plain eye. They explained that they don’t do small orders, only wholesale – but then a manager emailed me and told me that he was impressed with my silk site and my devotion to needle work, and he sent me a shipment of needles with his compliments. I was SO excited! The company packaging – I’ve gotten a lot of this reinforced green paper; it seems to be the Indian equivalent of plain brown paper wrapping. It’s got string embedded inside to keep it from ripping. It’s neatly and thoroughly taped shut. 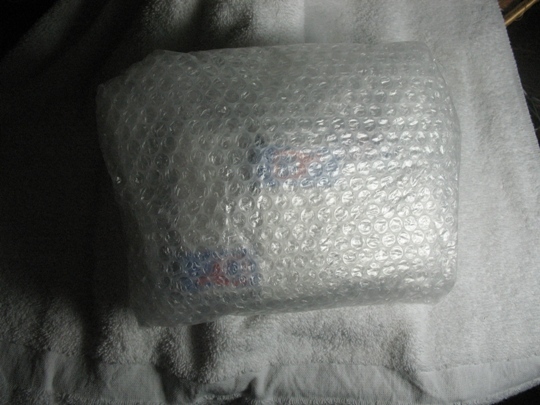 Inside the green paper, was a taped bundle of bubble wrap. 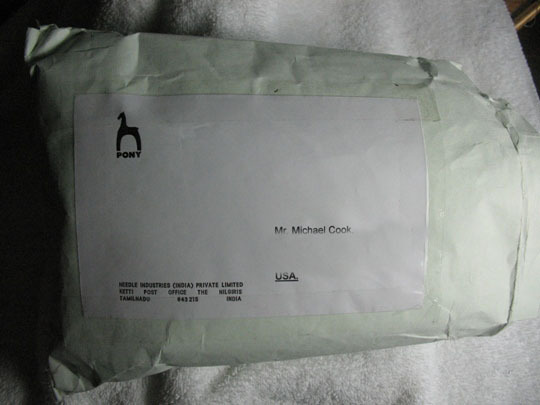 Inside the bubble wrap was a sealed Mylar envelope, and inside of it were four boxes and three smaller Mylar envelopes. The boxes each hold 10 cards; each card has 16 gold-eye needles. One box each of three sizes, 10, 11, and 12. And a box of needle threaders. 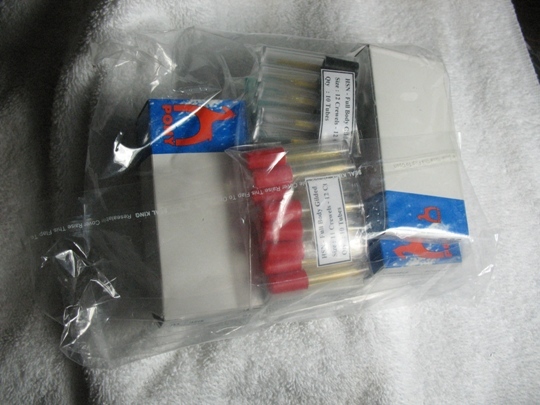 Each of the little Mylar envelopes holds 10 tubes; each tube has 16 needles, fully plated with gold. Did you read that bit? They’re golden needles. Like something out of a myth or a fairy tale. This is a gold-plated #12 Crewel. It’s kind of strange to handle – they’re a little slicker than the usual nickel-plated ones. It feels like I ought to be sewing clothes for the Elf-king or something. LOLOL I always use gold needles for my embroidery. It’s not because I’m a snob (kinda), but they last 2-3x as long because the gold finish takes a while to wear off. I know I woudl go blind trying to thread that! how wonderful!!! what a lovely thing for him to do. I have found that the Japanese usually pack things very well and usually impressively too. Wow, that’s a lot of needles! Enjoy them and use them in good health! I’m glad you got so many needles because my friend in Korea couldn’t figure out how to ask the local shop owners for them, and now he’s back in the states. Hee. It’s always tough, trying to buy something that isn’t the usual end product… I ran into that trying to buy wool and spindles in Peru. Silver threads and golden needles cannot mend this heart of mine…. oh my gosh – so many needles!!! that is so cool that he sent those to you! i used gold plated cross stitch needles. i can’t wear any metal except silver or gold. when i use regular needles they get all weird and dull looking and get hard to use after a while. the gold ones don’t do that until the plating wears off. they are a bit pricey, though – he sent you an real treasure trove! Wow! Isn’t it great when someone like that is willing to go the extra? 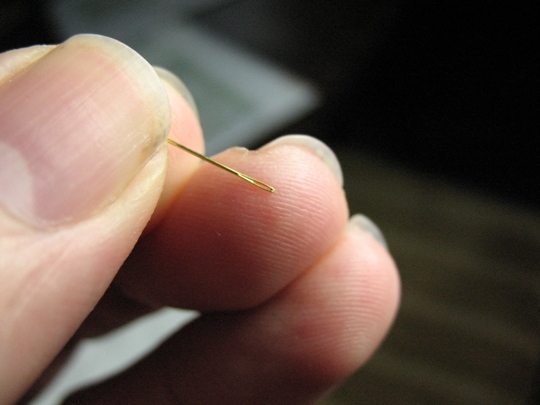 *LAUGH* Those are wonderful embroidery needles… I’ve used a few in my time – ones that I acquired in various places. I think I likely only have one of them left *somewhere*. I don’t do embroidery (by hand) like I used to. Hands just can’t anymore for very long. That’s really awesome of them! I just received a music CD from Japan, the first thing I’ve ever ordered from overseas, and it was not only solidly packed in cardboard and wrapped in bubbleplastic, as one would expect, but also wrapped in lovely green tissue paper over the bubblewrap. So pretty! Such a lagniappe!